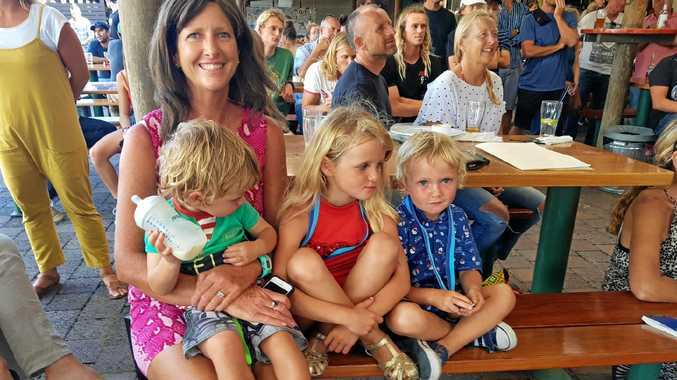 UPDATE 2.05pm: THE wife of a Byron Bay man killed in a shark attack this morning had been waiting for him on the beach when he was attacked, police have said. Addressing media at Clarkes Beach a short time ago, Inspector Bobbie Cullen said police believed the man had been attacked by a white pointer. The man's name has not yet been released with Insp Cullen saying police were still contacting relatives. However, she confirmed the man was a long-time Byron Bay resident and was aged in his 50s - not his 40s as previously reported. Insp Cullen said the man was bitten on his right leg while swimming alone at Clarkes Beach. There were no plans to cull the shark, although Insp Cullen did not rule that out. At present officers from Marine Area Command were searching for the animal and hoped to be able to scare it away from the area. Shark experts from the Department of Primary Industries were being flown up to Byron Bay to secure a more positive identification of the shark that bit the man. Insp Cullen said a white pointer believed to be responsible for the attack had been sighted earlier and helicopters were currently trying to find the animal again. Surf Life Savers have said the beach will remain closed until they knew what they were dealing with and could be sure it was safe, suggesting the closure could extend beyond the 24 hours announced by Byron Shire Council this morning. 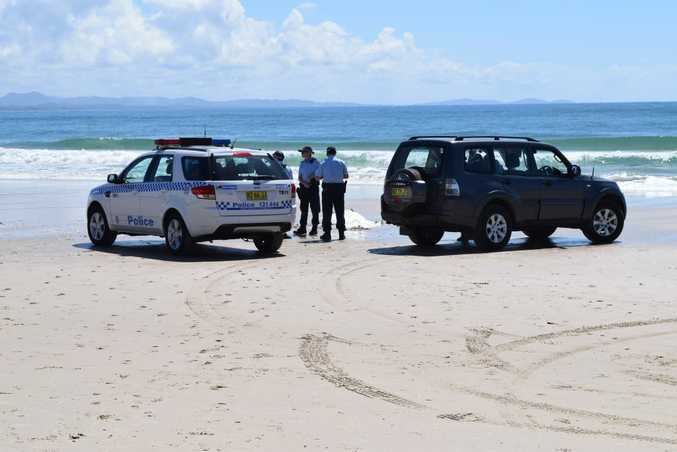 12.40pm: A MAN killed by a shark at Byron Bay was a local resident, police have confirmed. In a statement, police media have said the man has been formally identified by a family member. Police say the man was from Byron Bay. He is yet to be named and police are still trying to confirm his age. FATAL: The scene at Clarkes Beach this morning following the fatal shark attack. BYRON Shire Council has announced it has closed all beaches between Belongil and Tallow Beach for 24 hours. Posting on its Facebook page, the council says it has stationed lifeguards at Main Beach to keep people out of the water. "Everyone is requested to stay out of the water until advised further," the council's Facebook post says. THE man who pulled a shark attack victim to shore at Byron Bay this morning says the victim appeared to have been swimming when he was attacked. The rescuer, who did not wish to be named, said he was on a paddle board at around 10.30am when he saw what he thought was a turtle and some seaweed in the water about 20 metres away. He saw a shark about six to seven foot - about two metres - long circling it, and he returned to the beach. Someone then suggested it was a person and the rescuer walked back into the water and dragged the body to shore. He said there was a gash on the leg above the knee and the man appeared to be dead when he arrived. He performed CPR for 20 - 30 minutes before rescue services arrived. NSW Ambulance Service confirmed the man has died, after initially saying he was in a critical condition. He said the man had flippers on and assumed he had been swimming at the time of the attack. This is the first fatal shark attack at Byron Bay since 1993. Almost exactly two years on August 31, 2012, Australian Surf Tours uploaded a video to YouTube "from one of our mates up in Byron Bay". It claims to show a Great White Shark within 200m of Wategoes Beach shoreline. Wategoes is about 1km away from Clarkes Beach. In the caption, the uploader said: "Very brave putting your hand underwater like that bro!" Surf Life Saving NSW officials said Byron Bay beaches were closed from Belongil to Tallows Beach, south of Cape Byron. "We've got our life guard service on its way and our life guard supervisor is on his way and they'll be instituting a full beach closure, that whole headland area," a spokesman told Fairfax. The beach was not supervised at the time of the attack, as it occurred about a week prior to the life guards' seasonal duties. A MAN in his 40s has died after a shark attack at Byron Bay. An Ambulance NSW media officer said the call came in at 10.42am, with paramedics called to Lawson St behind Clarkes Beach to treat a man in his 40s with a potentially fatal shark bite. Paramedics who rushed to the scene were unable to save the man's life. "He did have a serious leg injury and as a result has unfortunately died on the beach after being treated by a doctor and paramedics," the officer said. Images from the scene show crowds gathered on the water's edge. Earlier reports said the man was a surfer who had been found floating in the water before being dragged in to the shore. A rescue helicopter was dispatched but was called off after the man died. The beach has been closed. Are you afraid of being attacked by a shark? This poll ended on 16 September 2014. The Australian Shark Attack File (ASAF) has been recording information on shark encounters for over 32 years. The ASAF is based at Taronga Zoo (Sydney) and works closely with the International Shark Attack File (ISAF). It shows the risk of injury or death from a shark bite is very low. In the last 50 years there have been 45 unprovoked fatalities (average of 0.9 per year) from shark encounters in Australian waters. Some years there have been no fatalities recorded and in other years there have been up to 5, but the average remains around one per year. Are Beyonce and Jay Z expecting a baby?